Cozy Knitty Cable Strip Hat on Etsy! 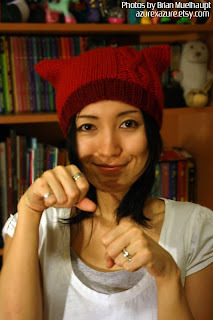 This---I also made just because I wanted to use that new needle, and I first tried to make a hat that you knit flat too, but I kinda failed. So I had to give in and use my old shorter circular needle (which, I also love, but I must admit the Addis are too good). I will be selling patterns for this one pretty soon. 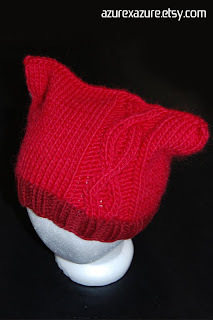 This may be a good starter hat for beginners and a bit more advanced beginners who wants to challenge cable knitting. There's only one strip of cable so its easy to keep track, and doesn't even have decreases (there is one row of increases but its easy to keep track), since you seam the top with the tapestry needle. Its basically a rectangle. What is the three needle bind off technique you mention in the pattern. I'm using circular needles.